» What is your religion or phylosophical moral code? » Now listening to . . .
» What do the Irish think of the English? Did a young woman buy her own tank in World War II and attack the Nazis? What were the chances of anyone taking any notice when a young Soviet telephone operator — after finding out the love of her life had been killed in the German Blitzkrieg sweeping across Russia — wrote in anger to dictator Joseph Stalin with a very strange demand? Maria (often spelt Mariya) Vasilyevna had enclosed her life savings in the letter, enough to buy a new T-34 tank. She asked not only to buy one, but to drive it herself to take revenge on the Nazis. With a world war raging, the letter should have had a snowflake’s chance in hell of being taken seriously. But Stalin was always open to a great propaganda idea. Maria was born on August 16, 1905, one of ten serf children living in a Crimean hovel. After the 1917 Revolution, she got a job as a telephone operator and, in 1925, met and wed a Red Army officer, Ilya Oktyabrskaya. Maria joined the Military Wives’ Council, trained as a volunteer nurse, learned how to drive Army vehicles and even how to use weapons. When, in 1941, Hitler unleashed the largest invasion in history, Operation Barbarossa — with 3.8 million German troops, 3,350 tanks, 2,770 warplanes and 7,200 pieces of artillery — Maria was sent east, ending up at Tomsk in Siberia. Two years passed before she learned Ilya’s fate. He had been killed by the Germans fighting outside Kiev in August 1941. Maria went into a fury when she heard the news. Then she sold everything and wrote this letter to Stalin: ‘My husband was killed in action defending the motherland. I want revenge on the fascist dogs for his death and for the death of Soviet people tortured by the fascist barbarians. Against all the odds, she got it, and joined the 26th Guards Tank Brigade as a driver/mechanic in September 1943. She was laughed at by the regular troops. A woman driving a tank called Fighting Girlfriend? The whole idea was mocked. But they could not have been more wrong. On October 21, 1943, in Smolensk, Maria opened the throttle on Fighting Girlfriend and charged — taking out antitank guns and machine gun nests, before herself getting hit by a shell. Against orders, she jumped out and, despite heavy enemy fire, fixed the damage, before continuing the fight. Her fellow troops gave her new respect and called her ‘mother’ after that. On November 17, the Red Army recaptured the town of Novoye Selo. Maria attacked German positions till an artillery shell damaged her tracks. Under covering fire, she again jumped out and fixed it. It was as if she had a charmed life. But it could not last. On January 17, 1944, near Shvedy, Maria attacked German trenches, machine gun nests and artillery, when again, her tank was crippled by a German anti-tank shell. As before, she fearlessly hopped out to fix it. But another shell burst, and she was hit in the head by shrapnel. 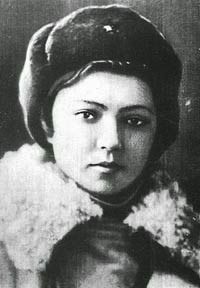 She was taken to a hospital near Kiev and died on March 15, 1944, aged 38. Benedict le Vay, author of Madcap Military Mayhem: The Bizarre, Barmy And Brilliant.